You are currently browsing the The Pet Product Guru blog archives for the day Wednesday, March 20th, 2019. My cat Millie loves her treats but I must admit, we give her too many. Treats should be a small part of your cats diet. They also have a tendency to make your cat overweight. Our goal is to decrease the amount of treats that we give our cat Millie. WebMD has put together 10 healthy treat tips for cats.
) Remember moderation. Like people, cats can develop a taste for treats, and they may decide to avoid their own food in favor of the goodies they love. For this reason, keep cat treats novel by offering them no more than two or three times a week, says Susan G. Wynn, DVM, CVA, a veterinary nutritionist in Georgia. Go easy with “people food.” Foods made for cats are formulated to contain the vitamins, minerals, and amino acids a cat needs for good health, so “people food” should be a minimal part of your cat’s diet. For an occasional delicacy, you might try small bits of cheese or cooked tuna, chicken, fish, or liver. You can also give your cat a tablespoon of milk now and again, but for cats that are lactose intolerant, this may cause diarrhea, Wynn says. Avoid toxic foods. Raisins, grapes, onions, alcohol, salt, tea — we may love them, but these and other common foods can be toxic to cats. If you’re not sure a treat is safe, talk your vet before giving it to your kitty. Ban begging. When giving your cat a treat, avoid doing it at the dinner table or at the cat’s insistence. Don’t reward begging. Go green. Catnip makes a fine cat treat, Wynn tells WebMD — and it’s low-calorie. Most cats love both catnip and “cat grass,” which is actually a cereal grass like wheat or oats. Both treats are easy to grow in a sunny window, and you can also find dried and fresh greens in pet stores. Always be sure the plant you’re offering your cat is safe for felines. But don’t be alarmed if your cat regurgitates the kitty grass you buy — some just do that. Stick with catnip for those cats, McGeorge suggests. If you’re not sure a plant is cat-safe, check the ASPCA’s web site for information on plants toxic to felines. If you think your cat may have eaten a dangerous plant call your vet immediately, or contact the Animal Poison Control Center at(888-426-4435). Give cat treats for fun and fitness. Help your cat exercise brain and body by using cat treats to train them in agility exercises or tricks. This can be even more enjoyable for indoor-only cats. Make your own natural cat treats. By cooking up small bits of liver, fish, or eggs for your cat, you’ll know exactly what’s in the treats she’s eating. You can even make organic cat treats for kitty by buying meat, fish, and eggs that are certified organic. 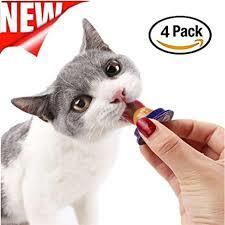 But remember, these treats should make up only a small part of your cat’s overall diet.